Rain affected Saturday’s league matches for the Dumfries sides. The APD Dumfries Western Premier league match at West of Scotland had to be cancelled, meanwhile at Nunholm, Dumfries 2nds, Eco-Genics Nunholm, batted first against Partick in the Western Premier Reserve League. However rain also stopped that game, and the 1st innings, with four overs to go with the total on 144 for 8. Andy Reed was the top scorer, and the David Hardie Engineers Man of the Match, with 52, with contributions of 29 not out from Mark Irwin and 27 from Jim Patterson. Youngster Chris McBride was the Nith Place Dental Practice Man of the Match in a win over Galloway by the Sunday XI, Good Man Dumfries, at Nunholm. He hit 43, aided by a fifty from Peter Lojszczyk, in a Dumfries score of 179 for 9. He also took four wickets as Galloway fell short with Anton Vosloo their top scorer with 58. APD Dumfries next play league leaders Uddingston at home on Saturday, the seconds are at Bothwell and Dumfries Women play Galloway at home on Sunday. 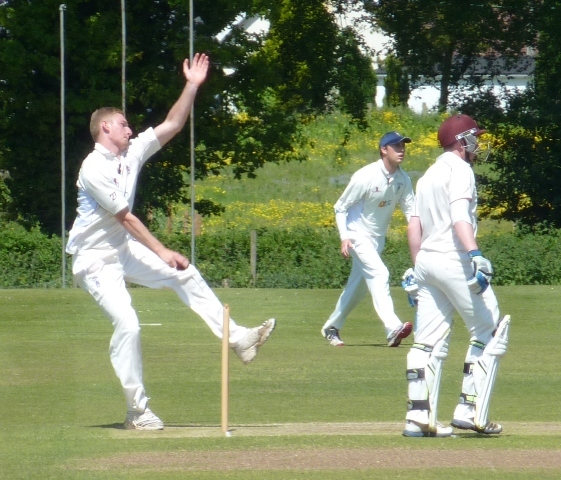 Dumfries’s Niall Alexander had an all-round performance for Western Warriors U18s with two wickets and 30 runs in a loss to the Eastern U18s in Edinburgh last week. He was also selected for the Scotland Development XI in their 3-day game this week against the MCC at Stirling. Junior Cricket: Club Coach Jonathon Osborne is nearing the end of this year’s club programme of school visits, supported by the DG Cricket Group and Cricket Scotland, with Elmvale Primary one of several primary schools having received free coaching this term. Club junior coaching sessions continue at Nunholm on Mondays 6:15-8pm. For details contact the club on dumfriescricketclub@gmail.com or 07799 856094, see www dumfriescricketclub.co.uk, www.twitter.com/dumfriescricket .